One of Chaos Castle’s favourite websites to browse through has to be Children’s Book Illustration. It does exactly as the name implies and has a gallery of wonderful illustrations from a host of amazing illustrators. Not only that, but you can actually purchase original artwork or prints. It’s an illustration lover’s dream. We’re lucky to have a super-speedy visit to the castle from the amazing Lucy Cousins, creator of many luscious picture books including one of our absolute favourites, Maisy Mouse. Lucy Cousins is one of four illustrators I recommend to buy for all babies/toddlers, because the bright colours really appeal. Bella and Posie were both independently attracted to her books, and still love Maisy now they’re 8 and 6. I’m pleased to include an illustration of Za-Za in the show. ‘Za-Za’s baby brother’ is a book that is very nostalgic for me, because it was very autobiographical. It was the first book I made after my son Ollie was born. His arrival in the family was such an enormous experience for my two year old daughter. It’s such a common experience for little children, so I wanted to make a story about the good things and the difficult things, that come with a new baby sibling. 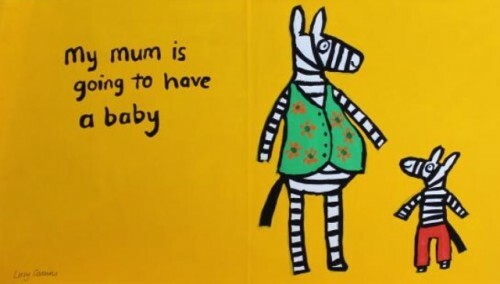 Imagining us all as a family of zebras was great fun! Reading about a family of zebras is great fun too. Thank-you so much to Lucy Cousins, and Children’s Book Illustration, for our mini interview. We hope we’ll get to see the exhibition, but if you can’t get to London that week, the artwork is also online to view and purchase.